Back in 2007, Korean picture book author KWON Yoon-duk decided to take part in the ‘Picture Books for Peace Planning Committee’, which was a collaborative art project by authors from Korea, China and Japan to create and publish picture books on peace for children. KWON chose ‘comfort women’, women who were forced into sexual slavery by the Japanese colonial army during World War II, as the subject matter for her book. 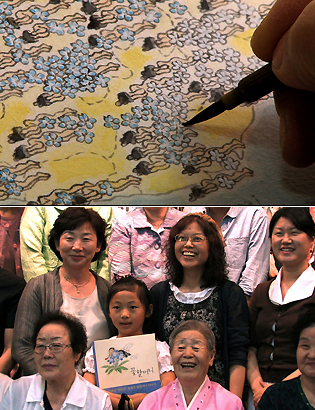 She visits and listens to surviving ‘comfort women’, draws them and tells their stories. But as KWON proceeds with the work, past wounds forgotten for years are brought back to haunt her. To make matters worse, the publication date of her book in Japan gets postponed indefinitely due to the complicated nature of its subject matter. Wartime sexual violence by the Japanese military against women of neighboring countries in Asia has remained an unresolved matter for decades and is still a source of discord between Japan and the affected countries. Most of the surviving victims have either passed away or are becoming very old and weak, and pushed out of the public eye. The Big Picture documents an artist’s effort to remind the public of the issue of ‘comfort women’ through creative art work, while also becoming a journey for the artist herself to cope with her past wounds. Featuring KWON’s drawings, which often speak more than words, The Big Picture shows an emotional and personal approach to a history that should be remembered and not be repeated.